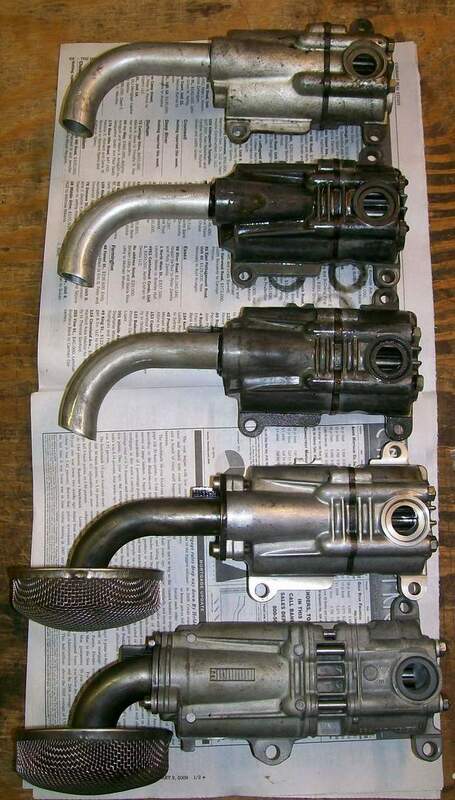 Pelican Parts Forums - Which Oil Pump ? I'm assuming you will have the oil bypass case mod done? Then, at a minimum, you'll want the 4 rib pump. If you go with the Carrera pump, you'll need to change your sump plate for the incorporated screen. There are several shops here that can modify the 4 rib pump for more flow. From everything I've read, these pumps are well designed and will meet your needs. From what I gather from these posts, there's not much gained by getting the turbo pump unless you're spinning this 2.45 crazy RPMs. You certainly want a 4 rib or Carrera (your 05 part number?) pump. Aluminum is preferred over Mg for rebuilds because Mg doesn't wear as well. Actually the 930 version is $100 less thank the 911 . Seems buying new Porsche pump is better than a used reworked SC or other. Not sure on price for the SC but the new 930 is $698 . Frank, where do you find the 930 pump for $698? Thing to check also is that it's not superseded but 996 unit. This is what Ollies sells. 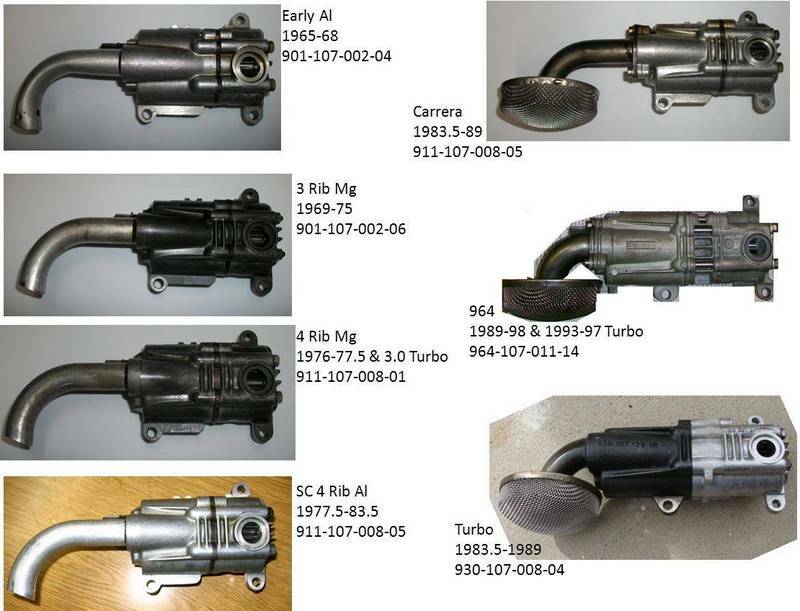 The turbo pump is $698 on Sunset Porsche site with part number as noted. BTW also chasing for P&C sets...considering the 86mm CP pistons @9.5/1 paired with Nikasil Mahle. Looks like $2,200 with supplying my original cylinders as cores. You're welcome. I'm going to do a similar build at some point and will continue to follow your progress. Is that a new or used pump for that price I wonder? Just found this thread... So porting and polishing can increase oil flow 20%? Anyone done this? Is a 20% increase in flow equate to a 20% increase in pressure? The Turbo pricing advertised on some sites has upgraded prolong. So guess I'm looking for a good 4 Rib? I really don't follow the reasons why we need to change pumps and why it seems essential to spend so much money. The flow of a gear pump is really a function of the number of teeth, the length of the gear and the number of revolutions. This is the reason why these parts are described as 'Constant Displacement'. The flow required by the engine is a function of bearing clearances and a few other variables such as the volume required by piston squirters. Once we make the pressure relief valve operate we have sufficient flow to meet the engine's needs and any pressure that is generated causes a parasitic loss of power. It is customary to provide a pump with sufficient volume to ensure adequate flow to the bearings at idle speed and this will generally result in around 75% of the pump's capacity flowing through the by-pass at peak engine speed. Modern Race engines are now tending to use electrically driven oil pumps that are 'adaptively' controlled and vary the delivery in a controlled manner to minimise these losses. If the inlet port of a pump significantly restricts flow then the suction pressure produced by the pump will create a reduced pressure in the gear mesh and in the limit the oil will vapourise and the pump will then cavitate. This would have disastrous effect on the engine and would result in a virtually instantaneous failure. If the internal surfaces of the pump were so poor as to cause sufficient drag to lose 20% of the flow capability of the pump then we need to ask where does it go? Does the increase in pressure that would result increase the 'spill' though the mesh?, does it increase axial spill or does it increase radial spill? I don't understand how this loss can occur. A 20% increase in flow is more than likely to travel though the by-pass assuming that the basic engine has sufficient flow in the first place. I understand the reason for the Kramer By-Pass modification as it helps to reduce the oil volume in the crankcase and this must be of great benefit in terms of windage. Let us remember that windage is proportional to the 5th power of rotational speed and that the density of the oil mist present in the crankcase also has a VERY significant impact. If you measure windage in air and arrive at a value and then add 1% of oil by volume then windage will increase by approximately 20 times. By using a 4 rib pump the impact will be to increase the oil flow through the by-pass but also to reduce the pump's scavenge capability which could result in increased temperatures and parasitic losses. Using pumps with increased scavenge seems to be a good plan but I am not always sure why we seem to believe more flow is a good idea - particularly when it comes at the cost of scavenge. It would be good to take a poll to see how many engines suffer from oil starvation and what the real benefits we gain from increasing flow. Has anyone fitted a 4 Rib Pump to a 2.0 litre engine that doesn't have piston squirters installed into a case with the Kramer Modification? The delivery from the pump simply overwhelms the By-pass and the pressure reaches the 'safety' system by-pass at around 140psi. I would really like to understand why we are generally told that we need pumps with more flow as so far I am not 100% convinced. Generally I like to size my oil pumps based upon what the factory did in their specific application. From there, I decide if I am adding features the original motor never had...i.e. a front mounted oil cooler. If so, I size the pump accordingly. My 2.X builds and up automatically get a 964 pump. Anything north of 3.6 gets the GT3 pump or even an autoverdi. I agree with you about pump size and volume on the supply side. The latest pump for the 997 uses a 51.00mm pressure gear and I think the early pumps used 36.0mm and 43.00mm??? Porsche pumps are plenty efficient on the supply side, but are woefully inadequate on the scavenging side. The new pumps in the 991 engine are a piece engineering marvel. Unfortunately they cannot be fitted to these early engines nor controlled. We are running way less pressure on the supply side, tighter bearing clearances and oil that is low viscosity, without any issues in race engines some producing upwards of 900 HP and or 9000 RPM. Getting the oil out of the engine case is the problem. The pump pickup face down where the least amount of oil is. The only oil there is what drops down off the case wall to the bottom. The majority of oil is stacked up against the case wall via centrifugal force. This is why wind age trays and knife edged cranks make no difference wind age wise. The use of spur gears on the scavenge side is not the most efficient suction type. Spur gears separate the oil/air into sections as its rotated around the pump housing thus adding more air into an already air filled oily mist. If these Porsche engines ran in vacuum this would not be an issue. However these engines run a positive crankcase pressure. With no air separator, the oil returned to the tank cools slower, and when sent back to the engine is still full of air. I'm not quite sure how porting the pump sections helps but anything done to help on the scavenge side has to be a plus. I had this same conversation with Singer when discussing my cases. Everyone is looking for a way to scavenge more oil out of the case. My suggestion was additional ports on case that feed an electric on demand pump. They didn't have room in their engine bay for such a setup, but I think it's the way to go. You would want a higher flow pump not for additional oil pressure; you want to move more volume and change the oil in the FMOC more frequently. The 930 pump is a great pump, and you can add a FMOC to a 930 without having to change the pump. If I was doing it from the outset, however, I would use the GT3 pump. I do enjoy the physics and commentary. that's where these ideas come from , as I am sure you know. and on again with each larger capacity engine.....maybe all not the best on the scavenge side but why would they not address it? My simple mind ( not at all an experienced builder) tells me higher pressure forces Oil In gaps and moving parts that have tight tolerance . Also just following Porsche advancement of pumps and application for a current engine build and applying best practice with advanced engineering that's available. Spoke to Glenn Yee he advised that he can rebuild and tune my early style pump to be as good as the later 4 Rib and turbo pumps . Given above comments this should work do an adequate job. What else is out there ?